Olli Tuominen continued his good run of form in the second round of the Davenport Pro Championships 2008. On the back of his recent home win in the Finnish Open, Tuominen ousted David Palmer only to lose to John White in the quarters. Darwish beat Ashour in five to set up a semi-final meeting with James Willstrop. The Egyptian number 3 is also on a roll, with his current spell in the US already having born fruit in taking the Oregon Open. Having played in the shadows of Shabana and Ashour since Ramy burst on to the scene, it seems that Darwish - a former World Junior Champion - is not content to sit back and watch his compatriots hog the spotlight. 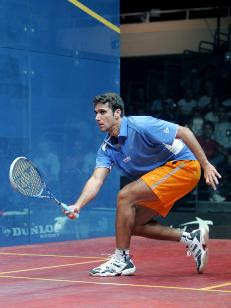 Karim has been as high as number 5 in the world (March 2004), but since then has hung around the edge of the top 10. The US has been a relatively successful hunting ground for the 27 year-old from Cairo, with decent runs in recent years in the Tournament of Champions and US Open. Great win in the final for Willstrop - how many big tourneys has he won recently?